In this article, I will review the VR Drive II panoramic system using the practical examples and experience I gained from using it in various situations. Due to space considerations, I will not cover the panoramic composition and the panoramic viewpoint, also I won’t spend time on the actual stitching methods. If there is an interest in these subjects, I can address them in follow-up articles. I was first introduced to Seitz rotational film cameras in the mid nineties when I used the compact 35mm Roundshot 35/35 (pictured here) and the 120mm Super 220VR cameras. One of the most interesting things about using the Super 220VR camera with different lenses was that it was possible to produce a single negative (or transparency) between 10cm and 200cm (yes, up to two meters) long. 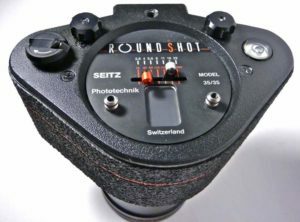 Seitz Roundshot VR Drive II is not a new device, although it is still relatively unknown outside of a rather small group of panoramic photographers. The original VR Drive was announced by Seitz Phototechnik about twenty years ago, and its revised version II was introduced about 8 years ago. The VR Drive II panoramic head which is available today, is still mechanically pretty much the same, but in the recent years Seitz added some new features, such as an integral lightmeter, external lights, and numerous firmware updates to accommodate the new digital cameras and multiple image formats. From this point to the end of the article, I will use just the term VR-Drive, but keep in mind that I’m actually referring to the latest VR Drive II model. VR-DRive is now compatible with many cameras. I tested it initially with an old APS-C sized Nikon D300 with a 18-50mm lens, but later switched to full frame Canon 6DII with a 20mm prime lens. Nikon D750 with a 20mm Nikkor lens would be functionally very similar, but the 6DII outputs slightly larger image file (26MP vs 24MP) and that was one of the reasons why I chose Canon. 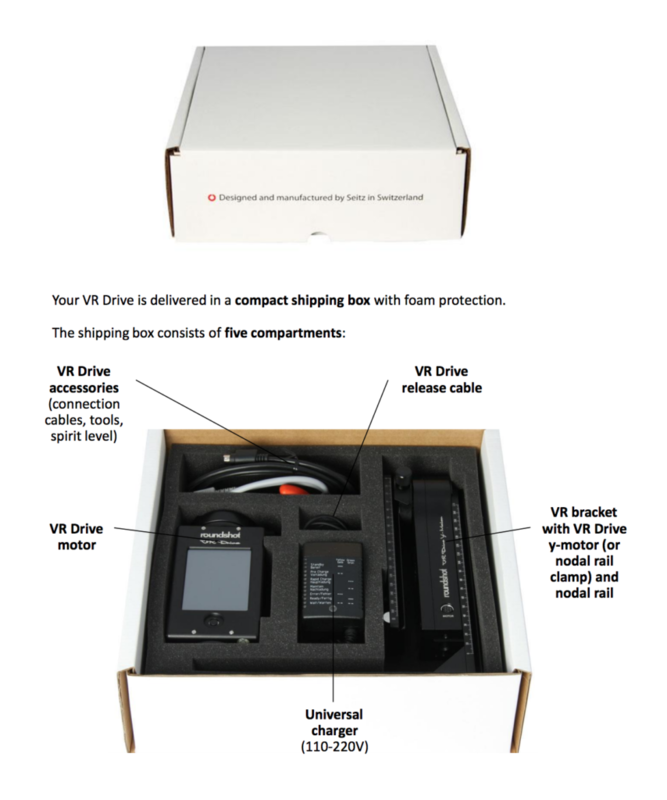 VR-Drive is shipped in a simple carton box with a foam insert to keep the individual parts cushioned during the transport. It consists of two main parts – the main computer brick-like unit with a touch sensitive screen and a built-in motor to rotate the camera horizontally, and a sturdy vertical arm with another motor to tilt the camera and to move it up and down. These two main units are connected via a sturdy metal bracket which is used also for nodal adjustments. Below the screen is the main power on/off button, but otherwise all operation and programming is accomplished by using the touch sensitive screen on the front of the main unit. I will not go into the detailed technical specs and step-by-step setup, but if you are interested in the those details, you can go to Seitz website and download the complete VR Drive technical manual. The important thing is that after the assembly and calibration of the mechanical parts, you must create at least one VR-Drive program for your camera and the intended use. This procedure is easy and it consists among other things of specifying the camera model, focal length of the lens, and the scene coverage (full 360-degree pano, half pano, or even multiple rotations). If you define the absolute starting and ending positions, VR-Drive will automatically determine how many rows and positions will be required to cover such a scene. For my own situation, I created initially one program for a 180-degree single row scene (5 vertical images), second program for a 360-degree single row scene (9 images), 360-degree spherical 3-row scene program (30 images), a 3-HDR 360-degree spherical 3-row scene program with 90 images, and a 5-HDR 360-degree spherical 3-row scene program with 150 images. That was just for the 20mm lens. If you want to use 50mm or longer lens, the setup effort would be practically the same, but since that lens will cover a narrower angle for each captured image, you would end up with many more images for each panorama than with a 20mm lens. VR-Drive can hold up to 99 programs specifying details such as camera and lens models, number of rows and positions in each row, time delays between the camera movements, single exposures or HDR shooting modes, shutter speed and other parameters. The picture below shows one of the VR-Drive screens used for defining a program. Once a program is defined and saved, you can retrieve it and start its execution by pressing the Play button. If your VR -Drive is equipped with a lightmeter, the system will first scan the entire scene and measure the ambient light over the entire scene (360-degree or shorter). Then it will turn the panoramic head to the first (home) position, trigger the shutter and advance to the next position – at first in the same row, and in case of multiple rows, it will do all positions in one row, then switch to the next row, and so on. This process is fully automatic and depending on the available light and total number of images it can take from under a minute to 15 minutes or even longer. When the VR-Drive is connected via USB cable to the camera, it passes the specific image information (lens focal length, image id, yaw, pitch and roll) to the camera which writes it into the image metadata, and that information can be later used by the stitching program. 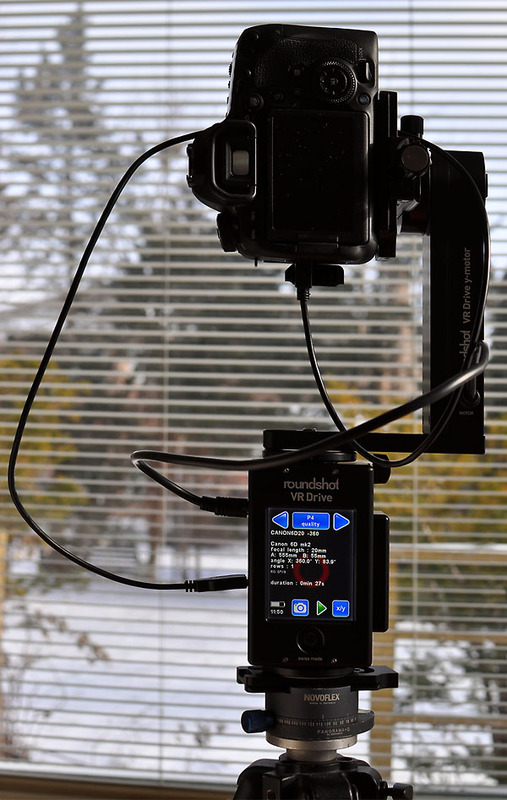 The VR Drive’s strongest feature is its panorama mode in which the system rotates on the tripod and triggers the camera shutter at pre-set positions and/or intervals. Taking the pictures in a static scene is very straightforward – you just press the start button and wait until the whole turning and capture process is finished. Photographing fast sport action or an outdoor scene with moving people or vehicles is more challenging, because if you catch just one part of the person or a vehicle in one image, and the camera takes a few seconds to advance to the next position and settle before the shutter is triggered again, that object will have moved and can be totally missing from the subsequent image and that would create problem for the stitching program. For such situations, VR-Drive provides a Stop and Pause buttons (see below) that can be used to suspend the programmed sequence until the scene looks more suitable (i.e. the moving object is in the middle of that image segment or completely out), and then you can continue the sequence from the stopped position, or even backtrack to the previous position and restart from there. The red Stop button is used to abort the current panorama shoot altogether. While on this subject, VR-Drive gives you a choice between two panorama shooting modes – Quality and Speed. Quality is the preferred mode, used for the majority of static scenes, whereas the Speed mode is used for shooting rapidly changing scenes, such as ocean waves, sports, street traffic, etc. In the Quality mode, the camera waits a bit before being moved to the next position, and then waits again to settle before its shutter is triggered. Quality mode is also more suitable for shooting in difficult lighting conditions and for HDR exposures. In the Speed mode the camera is rotated continously (at the maximum speed of 6 seconds per full rotation) and shoots without stopping. In this mode, the camera shutter speed should be set to at least 1/500 sec, preferrably to 1/1250 sec. The absolute minimum shutter speed depends both on the rotational speed and also on the lens focal length, for example the shutter speed for a 13mm lens could be more than twice as slow as for a 35mm lens. To avoid any blurring, the VR-Drive will suggest the minimum safe shutter speed for different rotational speeds. Reassuringly, even the Quality panorama mode can be used in many situations for moving objects. 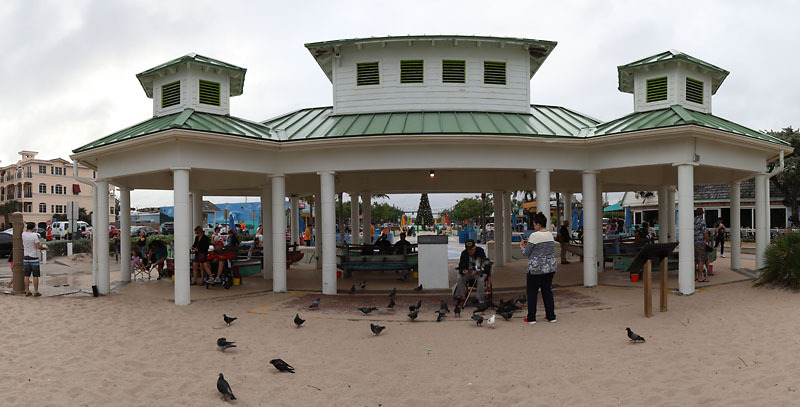 The following image is a 360-degree scene with many people sitting and walking, and even a car. If you get the entire moving object in the image frame, the stitching program will produce a good panorama. As you can see from the enlarged pictures below the original image, all persons have been captured and depicted without any blurring or ghosting. Shortened and magnified section from the image above. Shortened and magnified even more. In addition to the conventional panorama modes, VR-Drive offers also a rotating turntable option, linear rails, dolly on wheels, timelapse, and video modes. These are more advanced modes for special situations, most of them requiring additional hardware items. The video mode allows to record very smooth camera sweeps, either in a horizontal direction or even combining the horizontal and vertical movements. Another unique setting is the 32-bit HDR mode which can be used to create panoramic images with a higher dynamic range than just with using the standard camera HDR bracket mode, which is usually limited to +- 2 stops. So far, I used my VR-Drive & Canon 6DII combo mainly for shooting 360-degree spherical and cylindrical indoor and outdoor panoramas with 20 and 50mm lenses. I haven’t used the system for 180-degree landscape gigapixel panoramas with long lenses yet, but based on my previous experience with the Super 220VR camera, I’m envisioning and planning to use it in the summer with 100mm and 200mm lenses for shooting single and multi-row 150-200 degree outdoor panoramas. If you shoot just a few outdoor panoramas, the VR-Drive system would be more than you need, since you can create such panoramas quite adequately with any tripod or even with a handheld camera. Furthermore, shooting distant panoramas with a long lens using even very basic panoramic head is not too critical for correct aligment. However, if you are tasked with taking many high-resolution, high-precision 360-degree scenes with a shorter focal length, the VR-Drive system is an extremely efficient and reliable tool for such projects. As you can see in the picture above, the main unit is mounted on a tripod, and the actual camera is attached to the moveable arm. 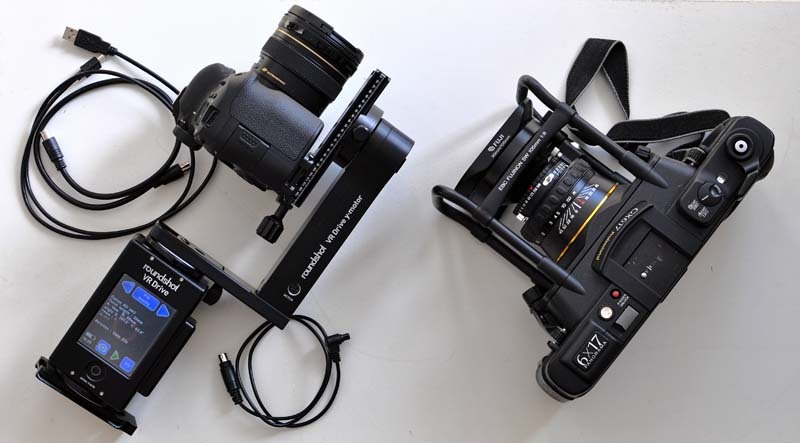 There are two motors responsible for the movements – the main unit rotates horizontally, while the motor in the sturdy camera arm can tilt the camera up or down. There are two cables used during shooting. One cable is used to connect and synchronize the two motors, and the second USB cable is used to control the camera shutter, aperture, and ISO by the VR-Drive. It is very important to arrange the cables in such a way that they won’t get caught by the rotating arm, since that could lead to the motor and cable damage. It would be nice to eliminate this risk and work without cables, using some contacts between these two VR-Drive parts or utilizing a Blue Tooth connection. Interestingly, I just heard that Seitz recognized this risk situation and will be offering a small cable clamp/organizer which should alleviate this problem. If desired, the VR-Drive control of the camera can be turned off and then the camera settings can be controlled directly on the camera, thus utilizing only VR-Drive’s horizontal and vertical motors. Some users will prefer ordering VR-Drive with several ready-to-go preset programs, while others will welcome the opportunity to define their own programs/presets. For instance, to make a simple linear 180-degree panorama using a 18-20mm lens, the camera will require five positions in one row, based on a 30-degree overlap between the individual images. The same camera configured for a 360-degree spherical panorama with the same wide-angle lens would require about 30-35 images in 3 rows, or 150 to 165 images if a 5-HDR exposure mode is chosen. On the other end of the extreme, shooting a distant nature scene in a 360-degree method with a long lens and 5-HDR mode might require 5-10 vertical rows, each with dozens to hundreds of discreet positions, thus resulting in possibly more than one thousand individual images. That’s just for one giant gigapixel image! After all the shooting phase is finished, the images on the memory card are ingested by a special program that inspects all captured images and organizes them into individual folders/scenes (as long as you used the correct USB cable and an VR-Drive approved camera). All source images in each scene folder are then processed by the stitching program which will combine those images into one combined panorama. Depending on the nature and complexity of the photographed scene, as well on your budget and preference, you can use Adobe Lightroom or Photoshop option, free Microsoft ICE or a specialized high-performance stitching program such as PTGui for generation of stitched panoramas. After the panoramas are completed, they can be cropped, tonally or otherwise edited and then inspected by any available image viewer or editing programs, either as a flat file or in a spherical/cylindrical projection mode. Optionally, the completed panorams can be linked through multiple on-screen “hot spots”, and furnished as interactive 360-degree VR tours. The large panorama file size allows a lot of room for cropping and creation of various views / segments of the merged picture. The following four images have been all derived from the same (top) panorama image, each offering greater magnification, until the very last segment which is about a 100% crop from the central portion of the original panorama. Canon 6DII with 20mm lens, F11, 1/160s, 9 images in a 360 scene (actual coverage about 375 degrees). The typical users of VR-Drive equipment will be professional landscape shooters, forensic photographers, architectural or real-estate companies, and law enforcement agencies. Although it is possible to produce impressive and highly accurate panoramas in a semi-automatic interactive mode, controlling both the VR-Drive panoramic head and the stitching software interactively in the manual manner, the greatest advantage of using this equipment can be realized by using it in a fully automatic mode. This means that VR-Drive can programmatically prepare hundreds of high-quality, high-resolution images that can be subsequently passed with just a minimal user intervention to the stitching program that will in turn work on all those images in an automated unattended batch mode. One button to start the shooting, and one click to start the stitching. Then, depending on your workload, take a coffee or an-hour long lunch, and when you come back, all panoramas are done. In a short time using this equipment, I was highly impressed by both, the external and internal design of this product. Even though more costly than GoPro, smartphones and simple small panoramic heads, VR-Drive is extremely accurate, well built, very reliable and can be cost effective for professional photographers who need to produce large quantity of high-resolution panoramas. 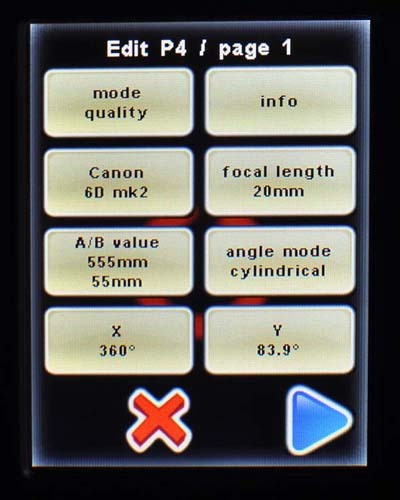 The image quality of the completed panoramas, especially when processed with the very powerful and flexible PTGui stitcher is simply outstanding, and the panoramas can be produced very effectively whether out in field or indoors. However, even using a combination of great individual pieces (VR-Drive, full frame cameras with outstanding lenses, and state-of-the art stitching software) is not guranteed to produce perfectly aligned panoramas in 100% of the situations. There can be always some tricky situations which will require manual intervention in PTGui (i.e. adding or modifying control points) or Photoshop corrections. If your work can justify the expense of VR-Drive, its advantages can easily outweigh its disadvantages. The system is a heavy-duty, industrial-strength, mature product which should last a long time. The mechanical parts are of a very high quality, the software interface is easy and intuitive, the system is quite versatile and the support is outstanding. From the viewpoint of an amateur photographer, when it comes to disadvantages compared to other panoramic solutions, I would list the higher price (in the neigbouhood of $4,000USD) and considerable weight (2.7kg) as its main impediments. VR-Drive seems also rather bulky, and not ideal for carrying when hiking. Nevertheless, it can fit easily (disassembled or even in one piece) into a medium-sized backpack, and it can be easily attached to the tripod on any location and put quickly into operational state (presuming you already have suitable programs stored in VR-Drive and are experienced enough with its use). The picture below illustrates relative sizes of the VR-Drive with attached Canon 6DII and an older film-based Fuji GX617 camera. The other important feature, if you are recording also video clips in the nature (or even in some cathedral), is the ability to use the virtually silent video mode of the VR-Drive, so you don’t have to carry a separate gimbal or a track dolly gear. 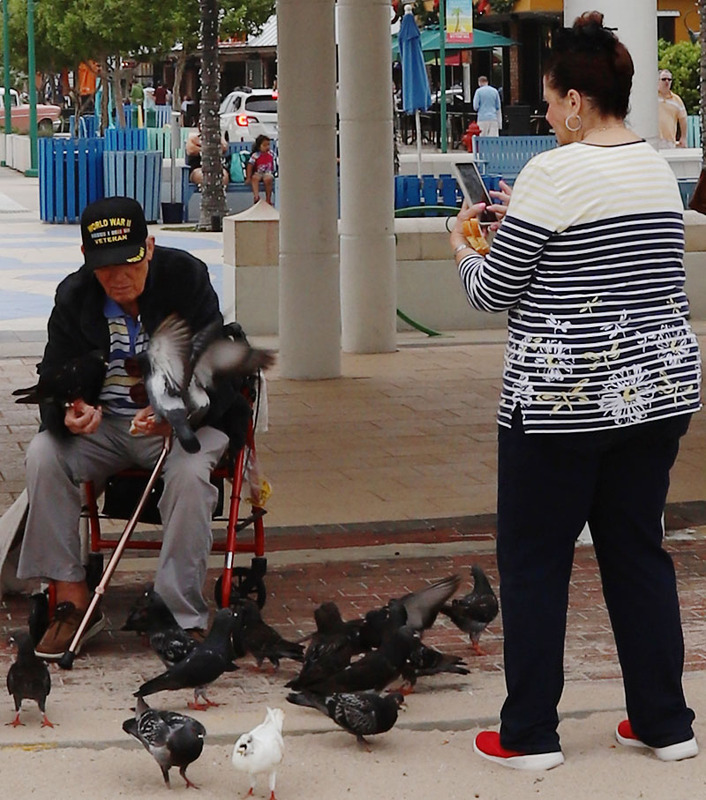 I recall that when I was carrying in the film days the Seitz Super 220VR rotational camera, or even the Fuji 617 or Gigapan gear, those setups were not any lighter or more portable.